At only 15 months old, Niko, a black American Labrador retriever, is ready to sniff out drugs for the Rumford Police Department. PERU — At only 15 months old, Niko, a black American Labrador retriever, is ready to sniff out drugs for the Rumford Police Department. Since July, Niko has been living and training with his partner, Officer Brad Gallant. 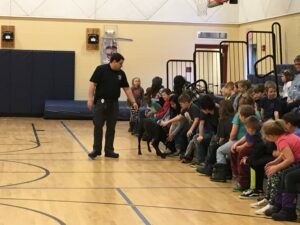 On Tuesday, the two crime fighters went to Mountain Valley Middle School to showcase Niko’s budding talents in front of students participating in the Western Foothills Kids Association after-school program. And on Thursday, Gallant and Niko visited the WFKA students at Dirigo Elementary School. Along with sniffing out drugs, Niko is learning to track and search for evidence at crime scenes. Or if somebody gets lost in the woods, Gallant said, Niko should be able to help locate the person. Niko has received 320 hours of narcotics or drug-search training, and he and Gallant will receive 480 hours of patrol school, which includes evidence recovery, tracking and biting. Gallant and Niko will be exempt from some of the training because Niko will not be asked to bite suspected criminals. Also at patrol school, Niko will be taught to be obedient and follow Gallant’s commands and instructions. To show the students how Niko works, Gallant had them distract Niko by petting him while Gallant threw a plastic “challenge coin” onto the gym floor for Niko to find. When he told Niko to find the coin, the dog raced around the gym, nose to floor, and eventually sniffed out the coin. Niko then received a dog treat for his good work. Gallant and Niko train at the Franklin County Sheriff’s Office. Gallant’s goal is for Niko to be fully trained in tracking and searching by June.